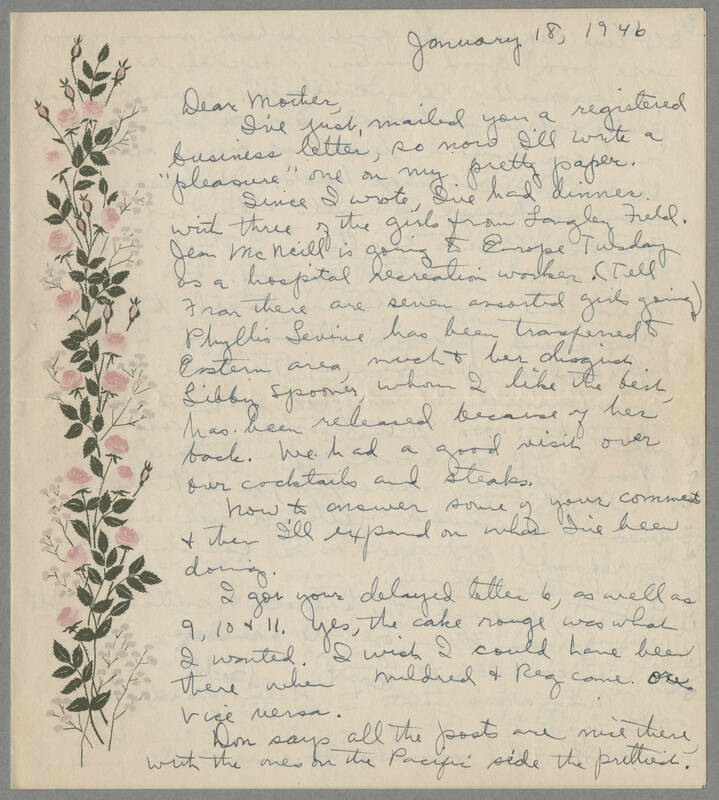 January 18, 1946 Dear Mother, I've just mailed you a registered business letter, so now I'll write a "pleasure" one on my pretty paper. Since I wrote, I've had dinner with three of the girls from Langley Field. [Jean?] McNeill is going to Europe Tuesday as a hospital recreation worker. (Tell Fran there are seven assorted girls going) Phyllis Levine has been transferred to Eastern area, much to her disgust. Libby Spooner, whom I like the best, has been released because of her back. We had a good visit over our cocktails and steaks. Now to answer some of your comments & then I'll expand on what I've been doing. I got your delayed letter 6 as well as 9, 10 & 11. Yes, the cake rouge was what I wanted. I wish I could have been there when Mildred & Reg came or vice versa. Don says all the posts are nice there, with the ones on the Pacific side the prettiest.